Welcome to The Skylight Guy's Frequently Asked Questions page! Here you will find common questions asked about skylights, tube skylights, and solar attic fans. Click on an image below to jump to the section you need. If you can't find what you're looking for here, please give us a call at 1-800-900-0759 and we will be happy to answer any questions you have. Using the energy of the sun, our products light up dark spaces and vent the excess heat and moisture our of attic spaces. It costs nothing to operate...SOLAR POWER-its free, why not use it and start saving energy today! What are the parts of a traditional skylight? What is a deck mount skylight? What is a curb mount skylight? When do I use a curb mount versus a deck mount skylight? 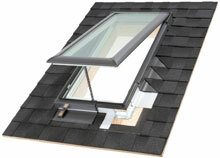 What kinds of glazing options are available in Velux skylights? Is a glass skylight better than an acrylic (plastic) skylight? What types of flashing kits are available? What is Ice & Water Shield or Adhesive Underlayment? What kinds of blinds are available? Are the blinds between the glass panes of the skylight? Can I install blinds later on, or do they have to be installed when I install the skylight? Can the blinds be controlled by remote control? Why isn't a rod or handle included in the price for a manual skylight? Are there specific code requirements in regards to the type of skylight glass? How do I put in a shipping claim if my product is damaged in shipping or lost? 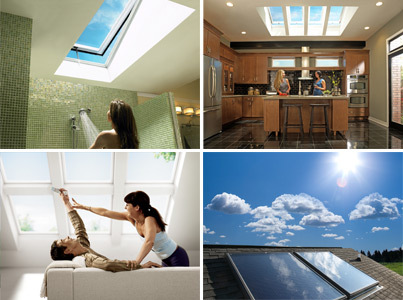 Click here to shop Velux skylights! Incorrect or improper installation - The skylight was installed incorrectly and water is leaking in from around the skylight, not through it. Broken acrylic skylight - The skylight is old and degraded from sun and weather, has either spontaneously broken or it was hit by something and broke. Problems also arise on acrylic skylights when someone decides to apply sealer or caulk at the junction of the skylight and the frame, usually because they have water coming in. This does not allow the skylight to expand and contract with changes in temperature, as it was designed to do. This will definitely shorten the lifespan of an acrylic skylight and make fracture inevitable! Acrylic skylights definitely have a lifespan; it may take 2 years, it may take 10 but at some point it will break and need replacement. Roof failure - There is a problem with the roof, and water will find its way through any openings in the roof. It may not become evident until the drywall starts to stain or sag. Click here to view Velux VSE skylights. Glazing or Lens - Most commonly acrylic, polycarbonate or glass; can be single or multiple layers (VELUX starts with two panes of tempered glass for their residential skylights). Layers usually are sealed together and may be filled with inert gas for additional energy efficiency (VELUX uses argon between the first two pieces of glass). May have coating for improved energy efficiency (VELUX uses a low-E3 coating on all 2010 residential skylights). May have an additional layer of glass laminated to the first pane. Frame - The glazing is supported by a frame which is wood or aluminum. Cladding - Holds the lens to the frame. Curb - Used to elevate skylights up off the roof deck (plywood). Used on flat roofs or with certain roofing materials. Underlayment - Membrane or seal for between the roof deck and skylight or curb; usually rubber. Flashing - Applied over the underlayment and integrated with the roofing materials as the final barrier to the elements. When purchasing a skylight, you want to consider the manufacturer, materials of construction, design, warranty and product/consumer support to be sure you get a skylight that you can trust and depend on! This is why we sell only the best! Click here to shop Velux skylights now. A deck mount skylight is a skylight that attaches directly to the roof deck. Deck mounted skylights combine a wood frame, the insulated glass panes, and the aluminum cladding. A flashing kit is used to cover the seam and make the installation water-tight. Click here to shop Velux deck mount skylights. A curb is nothing but a raised frame that certain types of skylights (curb mount) are attached to. The curb raises the skylight above the roof line. The skylight consists of an aluminum frame, insulated glass panes and a rubber gasket that seals the skylight on the curb. Flashing kits are provided separately. Click here to shop Velux curb mount skylights. The decision to use a curb versus a deck mount skylight is often based on the preference or experience of the installer or contractor. There is one exception to this - flat roofs will require a curb mount skylight to keep water from submerging the skylight and causing leakage. Click here to shop Velux curb mount skylights. Click here to shop Velux deck mount skylights. Tempered – dual pane tempered glass, argon filled with a low-E coating. Tempered glass consists of tempered safety glass triple-coated with LoE3, dual-sealed and injected with Argon gas. This quality glass provides excellent energy efficiency, thermal performance and protects against the sun's fade causing rays. Tempered glass is available for most VELUX skylights including VS, FS, VCM, FCM, and QPF. Laminated – an additional layer of glass laminated to the outside of the tempered glass. Laminated glass features a triple-layer of LoE coating for increased energy efficiency plus a laminated pane for added safety and protection from fade-causing UV rays. Laminated glass is available for most VELUX skylights including VSE, VS, FS, VCE, VCM, FCM, and QPF. White laminated glass – laminated layer is white; constructed as above in laminated. White laminated glass provides diffused daylight and features a triple-layer of LoE coating for increased energy efficiency plus a laminated pane for added safety and protection from fade-causing UV rays. White laminated glass can also be combined with other energy efficient options for even greater performance. White laminated glass is available for most Velux skylights includingVSE, VS, FS, VCE, VCM, FCM, and QPF. Impact glass – Impact glass is designed to meet the stringent impact test requirements for hurricane prone areas. Impact glass is available in select sizes for most VELUX skylights including VSE, VS, FS, VCE, VCM, FCM, and QPF. Miami-Dade glass - When installed in the FCM fixed skylight, this specially designed glass meets the stringent requirements for Miami-Dade County and the Florida building code High Velocity Hurricane Zone (HVHZ). FCM sizes 2222, 2246 and 4646 are standard sizes with Miami-dade glass. These sizes are stocked in Velux's central warehouse for fast delivery. FCM skylight sizes 1430, 1446, 2230, 2234, 3030, 3046, 3434 and custom sizes smaller than 4646 are available for special order. Snowload Glass - Snowload glass is designed for heavy snow areas. It also features a triple-layer of LoE coating for increased energy efficiency plus a laminated pane for added safety and protection from fade-causing UV rays. Snowload glass is available in select sizes for deck mounted Velux skylight including the VSE, VS, FS skylights. A microscopically thin, virtually invisible, metal or metallic oxide layer deposited on a skylight glazing surface to reduce the skylight U-factor or shading coefficient by suppressing radiative heat flow through the skylight. Laminated glass consists of two layers of tempered glass bonded together by a layer of transparent plastic (PVB). In case of breakage, the plastic interlayer is designed to hold the fragments together. VELUX offers an upgrade on its standard tempered glass. Laminated glass also significantly blocks out UV rays which prevents fading of furnishings. Argon is an inert gas. By sealing it between two panes of glass, you have less transmitted heat/cold into your living space. Argon is a better insulator than air. VELUX glass skylights are superior to plastic in every respect. It is more energy efficient and more durable. Glass skylights reduce external noises, won’t discolor, leak or allow drafts. A flashing kit seals and waterproofs the intersection of the skylight and the roof opening. The proper installation of the flashing kit is the most important factor in achieving watertight installations. Flashing kits are designed to accommodate specific types of roof material and roof pitch. Thus if you have an asphalt shingle roof, you must use a flashing kit designed for an asphalt shingle roof, same with a tile or metal roof the correct flashing must be matched to the skylight. This information will be displayed on our site under the “options” heading when ordering. Flashing kits are broken down into two main types; curb mounted or deck mounted. Curb mounted skylights use ECL flashings which are good for both asphalt and shake type roofs or an ECW for a high profile/tile roof. Deck mounted skylights offer more flashing solutions; EDL type flashing kits for shingle or shake roofs, EDW for tile roofs, and EDM for metal roofs. It is also important to understand that in addition to roof types and skylight models, flashing kits are roof pitch dependent; that is why we indicate the roof pitch on the specific skylight models we offer. Only curb mount skylights may be installed on flat roofs. Ice & Water shield is a roofing underlayment. It is a thick rubber membrane with a self-adhesive backing that we recommend you use to wrap the skylight and the adjoining roof area that surrounds the skylight. Once the skylight is attached to the roof, the membrane is applied half of the width on the side of the skylight (or curb) and half on the roof adjacent to the skylight. This provides an added protective seal in addition to the roofing material and flashing kit. This is especially important in areas where ice and snow accumulate on the roof. We use it on every installation we do and we are located in the Phoenix desert. This is now included with the flashing in all deck mount skylights. The Ice & Water Shield is available for purchase on the “options” page when you order your skylight for curb mount skylights. This is called “ganging” and deck mounted skylights can be ganged together by utilizing the special order “Combination Flashing” kits that VELUX manufacturers. This flashing option is available for asphalt shingle, tile and metal type roofs. If you are interested in ganging the skylights together please give us a call at 800-900-0759 to discuss the specifics. VELUX manufactures several different types of blinds. Click here to shop Velux blinds. Roller Shades – The roller blind increases energy efficiency up to 16%, reducing your heating and cooling costs due to the better natural climate control in your room; it diffuses direct sunlight to significantly reduce or eliminate glare on your TV or computer screen, which increases the versatility of the room. Available in electric, manual, and solar. Venetian Blind s – design features make operation simple and convenient, with a control mechanism that allows you to position the blinds at any point on the window. Improved aesthetics give you control over both the amount and direction of light, perfect for any room where light control and aesthetics are important. Available in electric and manual. Lightblock Shade – fabric that has an energy efficient aluminum coating on the exterior side that acts as a heat barrier and increases the energy efficiency up to 20%. This room darkening shade blocks 98% of the light and is great for bedrooms, TV/entertainment rooms. Available in electric, manual, and solar. Solar Power – Available on most blind options; qualifies for 30% Federal Tax Credit. Allows for a powered blind option on fixed skylights without having to do any wiring! No, there are no skylights offered with blinds that go between the glass panes. VELUX has a full line of blinds and shades that are specifically designed for installation in VELUX skylights. Can I install blinds later on, or do they have to be installed when I install the skylights? Shade/blind options can be installed either during or after your skylight installation. All VELUX electric blinds can be operated with the hand held remote control or the optional wall switch. One remote can control multiple blinds in one room. Why isn’t a rod or handle included in the price for a manual skylight? VELUX does not include these with the skylight because each installation is different. If you install a skylight in an attic space that you have converted to usable space, you can reach the skylight easily and need a handle. If you install your skylight in the ceiling then you need a rod. Some people also chose a motorized rod to open their skylight. Also for larger skylights there are stronger handles better equipped to last. You may only need to purchase one rod to operate several skylights. So since you have a choice with different pricing for each, they are sold separately. Are there specific code requirement in regards to the type of skylight glass? As with everything else, it would be prudent to check with your local building code officials to inquire about specific requirements for your area. In general, the standard tempered glass meets all US building codes, but there are exceptions; California code requires the use of laminated glass, certain areas in Florida require stronger impact or hurricane rated glass. We offer the right skylight for your application, if you have any questions please don’t hesitate to ask. When you order from The Skylight Guy, all products are drop shipped directly from the manufacturer. They are always brand new, in original packaging from the factory. VELUX products are sent from the closest distribution center to you and are generally shipped via a freight company. For this reason there are no tracking numbers per se. Product leaves the factory 1-2 business days after you place your order. If the package is not received in the expected time we can have it tracked through VELUX. Natural Light products ship within 24 hours on business days by FedEx or UPS. By the time we receive tracking information on the products, you will usually have it. If the package is not received in the expected time we can track it. On VELUX products we do not get tracking information since they usually ship via a freight company. If the shipment does not arrive in the expected time, we can start a tracking process through VELUX. On Natural Light products, we receive tracking information in 2-3 days. This is most times after the product is received by the customer. If the shipment does not arrive in the expected time, we can checking the tracking. Believe it or not, shipping damage is not very common. Less than 1% of our shipments incur damage. Since all products are shipped from the manufacturer, all shipping claims must go through them. The Skylight Guy will initiate the process, but it is handled by the manufacturer and not in our control. This may add time to the process to get new product shipped to you. If you are home when the package arrives and you see visible damage to the box, tell the carrier that you are going to check out the contents and if there is damage you can refuse the item. Just call and let us know and we will get you a replacement immediately. If you discover damage after you accept the product, your claim may still be covered; just inform us of the damage and we will initiate the right course of action. What is a sun tube/ tubular skylight / Sun Tunnel skylight? Why use a tubular skylight / sun tunnel ? How do I determine the right size sun tunnel / tubular skylight to use for my room? Will the tubular skylight / sun tunnel work on cloudy days? Is the dome material durable? Is placement on the roof important? Are sun tunnel / tubular skylights energy efficient? Do they allow heat in or out of my home? Do sun tunnel / tubular skylights leak? How long does it take to install a tubular skylight / sun tunnel? Can I install a tubular skylight if I have a cathedral ceiling? Do I have to insulate my light pipe? Will there be condensation? 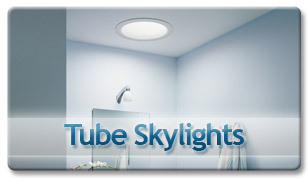 Click here to shop Tube Skylights! 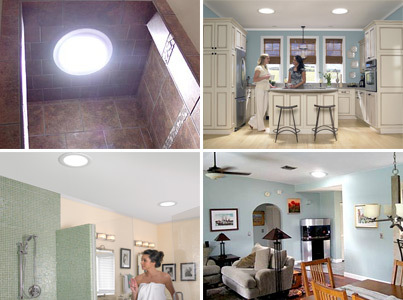 A tube skylight is a product that transfers natural sunlight into useable light that lightens up dark rooms. The technology used to accomplish this is a super reflective light shaft and precise engineered diffusers. The mirrored surface of the light pipe reflects the solar light down the tube. Why use a tubular skylight / sun tunnel? A sun tunnel tubular skylight efficiently provides pure natural light while effectively minimizing heat gain and heat loss since it is a sealed system. 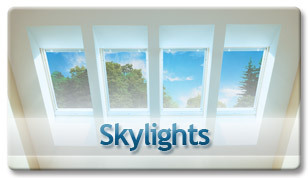 Tubular skylights eliminates dark rooms. There are many benefits of living in rooms illuminated with natural light. Get rid of those dark room blahs for good! Plants thrive in rooms lit with natural light as well. Sun tunnel / tubular skylights reflective system transfers light down to the room with minimal light loss on cloudy days. The engineered diffuser and state of the art optic technology incorporated into the light pipe allows light coming from any direction to be transferred down the tube, allowing the best light output possible. The tubular skylight dome is extremely durable. In fact, the Natural Light dome passed the most stringent skylight test in the country-the Florida hurricane impact test! The dome had to endure a direct hit from a 9 pound 2x4 traveling nearly 40mph and not leak one drop of water when subjected to 130mph winds and gushing rain water! The modified acrylic dome does not fade and weaken after years of exposure to the sun's UV rays. The Sun Tunnel dome is designed to withstand weather in all parts of the country. VELUX does offer an impact dome that is designed to withstand hurricane prone areas. The best location for any solar device would be on the southwest facing side of the house. Remember to take into consideration chimneys, adjoining roof structures or trees-anything that can cast a shadow over the dome is going to effect the light output. There is so much light energy in sunlight and the Natural Light Tubular Skylight does work well on the north side of a house. Just keep in mind that the best light output is obtained by exposing the dome to direct sunlight. Therefore it performs better where it receives as much direct sunlight as possible. In general, the ideal length of tube is about 6 feet. However, lengths over 15 feet are routinely installed with very favorable results. We recommend increasing the unit to the next size for runs longer than 14 feet. Sun tunnel / tubular skylights are extremely efficient; with virtually no heat gain or loss, they are also Energy Star rated and qualify for some state and all federal tax credits. Tubular skylights are seamless, therefore, providing that they are installed in accordance with the manufacturer's directions, they will not leak! How long does it take to install a tubular skylight / sun tunnel ? Typical installation by a homeowner is about 2 hours with common everyday tools. Yes! Natural Light manufactures a tubular skylight flashing designed just for cathedral ceilings making the installation a breeze. Please order a "FLAT" flashing for this purpose. If you are purchasing a VELUX sun tunnel please order the "TGR" model. No you do not have to insulate the light pipe. The system is designed to weep out any condensate that occurs and it works very effectively. In northern states please use the free optional soft diffuser which creates a double insulated diffuser and further protects the unit from large temperature differentials thus less condensation. Are solar attic fans energy efficient? What is the venting capacity of a Natural Light Solar Attic Fan? What warranty does the Natural Light Solar Attic Fan provide? What type of reoof can a solar attic fan be installed on? Can I install a solar attic fan myself? Is it difficult to install? Where should I install the solar attic fan on my roof? What comes with a solar attic fan kit? What tools are needed? Can I install a solar attic fan on a shady roof? Will solar attic fans withstand extreme weather? Can I turn off the attic fan when attic venting is not needed? Do I need a thermostat on my solar attic fan? Will the solar attic fan make noise? How do I receive a tax credit? Can I install a solar attic fan on a shed or garage? My attic already has passive venting, why do I need an additional attic fan? What materials are used to make solar attic fans? Click here to shop Solar Attic Fans! Yes, Natural Light Solar Attic Fans are so energy efficient that models installed on residential homes qualify for a 30% Federal Tax Credit. The unit operates for free all during the day powered by the sun - so there are no operating costs. Additionally, in the summer months, attic venting can reduce the load on your AC system - which can save on your energy costs. Natural Light Solar Attic Fans can be installed virtually on any roof of either residential or commercial buildings. The roof mounted model is designed for either pitched or flat roofs. The solar panel can be angled to the position it will collect the most sunlight providing optimal venting performance on all roof slopes. Both a curb and gable mounted units are also available. Our models accommodate all roofing material including composite shingle, wood shake, tile and clay tile. For some tile roof installations, an additional flashing skirt is needed. A homeowner can easily install our solar attic fans in about an hour or less. Installation requires basic do-it-yourself skills including using a reciprocating saw. The solar attic fan is fully operational right out of the box and no wiring or structural changes are needed. Each kit comes with illustrated step-by-step instructions. The solar attic fan should be installed on a south or west facing roof. It should be located in the center of the roof and about three feet from the ridge of the roof. Yes, Natural Light offers a unique version of our solar attic fan that allows you to install the fan assembly on a shady portion of the roof. The unit is powered by a remote solar panel that is installed away from the fan on the sunny portion of the roof. Yes, the rugged construction of Natural Light Solar Attic Fan can withstand the harshest weather conditions including hurricanes and tornadoes. The unit utilizes a high impact solar panel and a heavy-duty commercial grade aluminum housing. A custom storm model is also available for hurricane zones adding additional protection against heavy rain blowing up and underneath the unit. Yes, a small device called a thermal snap switch is available that will automatically turn ON and OFF your fan when the attic temperature is optimal and attic venting is not needed. Typically you do not need a thermostat for the proper operation of your solar attic fan. The solar attic fan exhausts the moisture that is trapped in your attic space that comes from the heat sources in your home as well as the environment. Moisture does far more damage to your roof structure than heat; ice dams and mold formation are the two major problems. I recommend using a thermostat if you live in a dry area, like the desert. 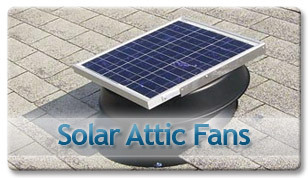 The solar attic fan is so quiet you will not hear it run from a distance of about three feet! To qualify for a solar tax credit, the solar attic fan must have been placed in service on a residential home on June 1, 2009 through December 31, 2016. Natural Light provides a Statement of Certification for the homeowner to download, complete and keep with their tax records. The Statement does not need to be filled with your tax forms, but income tax regulations require taxpayers to have appropriate documentation. To claim a residential tax credit, download IRS form 5695 and instruction sheet. On the 2009 1040 Form, the residential tax credit is claimed on line 52. Natural Light recommends consulting a tax professional if considering filing for a tax credit. Yes, the Natural Light Solar Attic Fan can be installed on any structure with a roof including sheds, barns, lofts, garages, workshops, guest homes - any space that could benefit from air circulation. Natural Light also offers a specialized garage vent kit that is added to a standard solar attic fan unit converting the fan to a garage exhaust venting system. Building codes require all homes to incorporate a passive attic vent system. The problem with passive venting is that it rarely provides the pressure needed to force out the hot, moist air that builds up inside your attic. Adding a motorized attic fan provides the pressure needed to drive out the hot air and improve air circulation. What are the benefits of attic venting? Attic ventilation helps maintain a healthy, energy efficient home. It extends the life of your roofing shingles and underlayment and reduces moisture build up that can cause rot and mold. Attic venting can also reduce the load on your AC in the summer, which can save you money. In colder climates, it prevents damaging ice damming. Natural Light Solar Attic Fans are manufactured in the USA using only the highest quality components under the strictest control standards. All solar panels used on our units are high impact and engineered so that they work to full capacity even under the harshest conditions. The housing and flashing are made of heavy-duty, commercial pure grade aluminum that is powder-coated inside and out. It incorporates a quiet, powerful direct current motor with a 25 year warranty.